Using essential oils for babies and kids isn’t the same as using them on adults. In fact, some oils are downright dangerous and can seriously affect your child’s respiratory system, desire to nurse, or cause skin damage. The last thing you want to do as a mother is to put your children in harm’s way. After all, you only have the best intentions. So let’s cut to the chase and address the elephant in the room. Generally speaking, yes. But not all oils are safe and intentional care is required. The good news is that there are clear guidelines on using oils on and around your child. 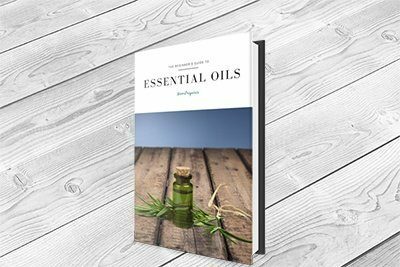 So we put together this guide with a clinical aromatherapist to ensure we deliver relevant and accurate information to our readers (that’s you). Which oils are safe for babies, toddlers, and children. Treating common ailments in children like constipation, allergies, cough, congestion, and more. Let’s dive deep into the guide. Do not use essential oils on newborn skins until they are at least six months old. There are two reasons for this. 1. A newborn’s sense of smell can be negatively affected. Newborn babies navigate the world by their sense of smell. That sense begins to form when the baby is just a 10-week-old fetus in the womb. Recent medical studies have revealed that newborns are able to recognize the smell of their mother’s amniotic fluid and breast milk at just three days old. The fluid smells similar to mom’s colostrum and this early milk is vital to boosting a newborn’s immunity. By three weeks, they can discern between mom’s fluid and anyone else’s. In other words, a baby’s sense of smell is so acute that an essential oil might put them off their food completely. 2. Newborn skin can be damaged by essential oils. When a child comes into the world, their skin is not formed the same as ours. It has special protective oils that outside factors such as essential oils can injure. Since conducting medical trials on babies is neither ethical nor rational, no research has ever been done on what happens when external elements, such as chemicals, hit a little one’s liver. It is possible that essential oils may not have the same effects on a baby as an adult. So here’s where we employ the “better safe than sorry” motto. Keeping in mind that using oils on newborns and infants can be unsafe, there are certain techniques you can use to help with constipation and to soothe colic. Abdominal massages are useful even without any oils. If you need to help a newborn work through a bout of colic, use dry fingers. For older children, where you may use essential oils, dilute them into a carrier oil. Use the lightest feather touch to stroke around the navel. Do two strokes upwards and two strokes across, above the navel. Then do two strokes down and one across the pelvis. Repeat for several rounds. Baby usually finds this very soothing. Here is a clip from a baby that resembles this action. After the massage, if they continue to have colic, try draping them on a warm towel or over a cushion on your lap. The warmth will help the oils penetrate quicker to bring faster relief. Any of these will also work well on older children and even adults. For infants in this age category, you can start using gentler oils in minimal amounts. Babies love massages and essential oils can be incorporated at this age, in small amounts. Try one drop each of chamomile, geranium, and lavender in two tablespoons of a carrier oil and use less than a quarter teaspoon during each massage. Do not use the massage oil daily. There is no need to use oils on a baby’s delicate skin too often. One of the most common issues with babies are diaper rashes. To combat this common infant ailment, add one drop of chamomile or lavender to a pint of warm water and mix it well. Strain this through a coffee strainer to remove any large oil deposits, then use the mix to wash the area with a clean cloth. After your infant celebrates their first birthday, you’ll likely run into more common problems like a cough or the common cold. And, of course, your first line of defense may be to look for a natural solution like essential oils. Both peppermint and eucalyptus oils are popular choices for cough and for the cold or flu. But are they safe for your baby? The chemical that can conjure up so much natural magic is also known as 1,8-Cineole (eucalyptol). Among other things, it helps slow down respiration. There is a risk that it can slow a babies breathing too much. It is best not to use on children before they are two years of age and then only on their backs. The menthol in peppermint oil has similar benefits, but can also cause the same respiratory issues. Keep eucalyptus and peppermint away from children’s noses and mouths. Do not use eucalyptus oil in diffusers around baby or be tempted to put eucalyptus on their pillow to help them breathe. Also, if you are using popular blends like doTerra’s Breathe or Young Living’s Thieves essential oil, I would err on the safe side and find a substitute. The Breathe blend has both peppermint and eucalyptus, while Thieves is a blend that contains eucalyptus essential oil. I recommend frankincense oil as a good replacement for stuffy noses. As a replacement to Thieves oil for babies, which also contains eucalyptus oil, I recommend tea tree to boost your child’s immune system. By now baby’s skins are formed and you can use oils more freely to reduce baby constipation and your child’s cough. If you choose to use essential oils on your baby, use a maximum dilution of 0.5%. Little solid pebble-like poop that sends their faces red and makes them squeal. Choose gentle laxative oils that relieve their discomfort and soothe their tempers. There are a few essential oils that stand out when it comes to constipation and colic. Roman Chamomile (Anthemis nobilis) – Lovely, lovely Chamomile. She is so gentle and soothing. Mandarin (Citrus reticulata) – Mandarin soothes digestive upsets. Rose (Rosa damascena) – Rose oil is a gentle laxative that softens stool. Dill (Antheum graveolens) – Blend dill oil with chamomile for fast and effective relief for colic and constipation. Baby constipation and colic both respond very well to using essential oils. Use oils in warm compresses, as well as massage oils to relieve usual symptoms. Soak a face cloth in a basin full of warm water with two or three drops of your chosen oil. Then lay the cloth onto their tummies. The savvy mom will position herself upwind of baby before the gas releases! While I am not a doTERRA user, I do get common questions about their digestive blend, DigestZen. From the little information that is on their website, the blend is made up of coriander, fennel and ginger. If you’re wondering if you can use it, I would not use DigestZen for babies. It’s a little strong for their tender constitutions. It is, however, a wonderful blend for kids and teens. Toddlers are prone to bumps and bruises, and essential oils are fantastic for healing the skin and calming tantrums, as well as settling a toddler’s cough. This is also the age when they are exposed to more germs. Whether that is through daycare, preschool, or school, the germs will translate into viruses that will cause colds, flu, cough, far too common congestion in children, and a whole slew of things this wonderful world has to offer. When your child hits the toddler years, it becomes safer to use oils on and around them. Below the age guide are common ailments that your kids may have. Rather than repeating it numerous times for each section, see the common ailments section. When using oils on your toddler, stick with a maximum dilution of 0.5%. As your children grow, so do their bodies. While their behaviors may become more immature, their bodies can handle slightly stronger dilutions. For kids who are aged 6 to 12 years old, you can begin using a maximum dilution of 1%. Teens and pre-teens. You may begin seeing acne, oily skin, be familiar with their allergies, and a whole repertoire of other things that may put you in panic. By this time, you can begin using a maximum dilution ratio of 2%. As mentioned above, I will be covering common ailments for kids below this section. You can always use less! Essential oils are very potent. One drop is usually enough. If you’re just getting started with essential oils, I highly recommend reading this article on diluting essential oils and this one on how to use them. Then come back to this guide and it will make it ten times more effective. Now that you know dilution ratios that are safe for kids and some oils to avoid, let’s tackle the most common ailments you’ll see in your kids. While we have some great posts on a good chunk of these ailments, they are focused primarily for adults. The ailments below are focused on kids who have reached a safe age to be using oils. Below is a list of my favorite oils for a kid’s cough. First is monarda essential oil (Monarda fistulosa). It is distilled from a flower that hummingbirds go crazy for. It grows as a weed in some parts of America and has been used in Native American medicine for many centuries to strengthen the immune system. The Lakota tribe bathe new babies with monarda flowers to improve their health. They use the flowers in sweat lodges to relieve chest congestion and as part of their spiritual journey. Frankincense oil slows down breathing, helping your child breathe more easily. This is a wonderful oil if a toddler’s cough comes from asthma or respiratory allergies. Frankincense comforts the coughing child and relaxes them right to sleep. This is a much safer and kinder choice than eucalyptus oil. One of the main reasons children get admitted to hospital is bronchitis. Niaouli gently eases coughs, but also boosts the immune system. Its antibiotic nature helps it to kill germs and infections. Eucalyptus is fantastic if your child is old enough for it. It is a decongestant and cuts through both chest congestion and stuffy noses. It’s best not to use essential oils continuously to prevent colds. It’s so hard listening to a coughing child, but colds are nature’s way of giving your child a stronger immune system. When their body comes into contact with a new germ, it learns how to deal with it. We don’t want to stop that learning process. Frankincense and monarda oils reduce coughing and help them to breathe more easily. You can add more oils to help them fight off the bugs and infections if you need to. Clearly, if you have a child that catches everything at school, essential oils can also help to build a stronger immune system too. Here are some great oils for colds and immunity. Tea tree is antiviral, antifungal, antibiotic and antiseptic. If there is a nasty germ of any kind, tea tree will zap it. Light switches, toilet flushes, bannisters, and bathroom faucets are prime breeding grounds for bacteria when you have babies and children in the house. I recommend putting three or four drops of tea tree onto a hot cloth, and then wiping down surfaces where bugs and infections lurk. I do it three times a day to prevent illnesses spreading if we have colds or diarrhea. Once a week seems ample enough if everyone is healthy. All boost the immune system and reduce the symptoms of colds. Peppermint unblocks noses, but so do plenty of other oils. So avoid it for the infant cold or for toddlers and young children. However, if your little one develops a fever, peppermint will bring it down quickly. Fevers are dangerous and scary things. You should always seek professional advice from a medical practitioner before using peppermint on your child. Fill your bathroom basin with hand warm water and add one drop of peppermint oil. Soak a face cloth in the water and squeeze it out. Put the cloth onto the back of your child’s neck and then take them to the emergency room. Stuffy noses are often a result of allergies. Hay fever, dust mite allergies, and cat hairs are the most common causes of reactions and rashes. Here are some great oils to fight allergies. Lemon Balm is a natural anti-allergenic. Her sharp, fresh lemony aroma is like a bright smile. Kids adore it. Be careful to source Melissa (True). You will often find the lemon balm plant covered in bees because its smell is so strong. But the leaves actually give up very little oil to distillation. Producers often add lemon verbena essential oil to make the oil go further and more affordable. Lemon verbena can irritate sensitive skins. Melissa True is pure Lemon Balm oil and it is more expensive, but much safer to use. Use chamomile for baby’s grazes and toddlers’ knocked up knees. It reduces redness and calms allergic rashes. The soreness diminishes and their mood lifts too. As with chamomile, lavender is soothing to sore and angry skin reactions. There are three particular oils that are great to fight congestion. Frankincense helps unblock stuffy noses and slows down breathing. Monarda works like a dream for sinus and chest congestion. Eucalyptus is wonderful for relieving coughs and colds in older children. Incidentally, the same applies for Eucalyptus radiata, Eucalyptus smithii, Eucalyptus citriodora. Diffusers have become extremely popular even to those who do not use oils for therapeutic reasons. Here is a list you can use as a general ‘safe for diffusion’ guide around the entire family. Lavender – Restful and calming. Lovely for helping everyone sleep. Chamomile – Calms tense atmospheres. Geranium – Reduces stress. Very useful for children with some autism spectrum disorders. Vetiver – Extremely sedative and grounding. Helpful after several sleepless night. Frankincense – Fantastic for everything for babies and children, and mom and dad too! Rose – Research shows babies and new moms bond better with rose oil. Ylang Ylang – Settles moms hormones and makes the home feel harmonious. Serenity Oil contains Ylang Ylang. Mandarin – Uplifting when you feel exhausted. Orange – A happy pill! Lemon – Kill airborne germs and make everyone feel better and happier. Tea Tree – Wipe out every enemy bacteria! Citronella – Uplifting and insecticidal. Keeps mosquitos out of the house. Oregano – Another great oil for cleaning the air of germs. Rosemary – Uplifting and stimulating. Clove – Kills bacteria and makes the house feel like the coziest Christmas. Cinnamon – Again, wonderful for cleansing the air and making the home feel cosy. Essential oils can keep your family safe, happy, and healthy. In the home, and especially around babies and infants, natural oils are easily stored and safer to use than the variety of chemicals in most germ-beating household cleaning products. When traveling with kids and teens, essential oils can be lifesaving on the go and in emergencies, so it’s always a good call to have a few of the basic ones ready in a travel pack. As your kids grow, they will learn to prefer essential oils and more natural remedies, when appropriate, to over-the-counter medication. Turning to nature’s best instead of the nearest pharmacy is yet another great and healthy habit we can teach them through example. However, it is of critical importance to know which oils are safe to use on and around your kids. As laid out in this guide, there are different dilution ratios. These should be followed, to the drop. And always seek medical attention for fevers or persistent symptoms, in both kids and adults. Use essential oils with care and respect and it’s happy days all the way! Have any tips about your own experiences with essential oils for babies and kids? Share them with other parents in the comments below! Hello My name is Nobathembu Zote I will like more information regarding a 6 to 12 months course in Zurich thats specializes with essential oil making.